Eugene Smith arrived in Pittsburgh in March 1955, a man hellbent on salvation. He had recently resigned as a staff photographer at Life, protesting what he considered the magazine’s botched layout of his photo essay documenting Nobel laureate Albert Schweitzer. Smith was 36 years old and one of America’s preeminent photojournalists. His work in the Pacific theater during World War II—along with subsequent essays chronicling a village in Franco’s Spain, a country doctor in Colorado, and an African American nurse-midwife in rural South Carolina—were landmarks in contemporary photography. His integrity and immaculate craftsmanship had earned respect tinged with wariness. Editors knew he could be as edgy as a junkyard dog. Now he was adrift. In debt, drinking steadily, battered by a diet of Benzedrine and downers, Smith hit Pittsburgh desperate to salvage whatever remained of his career. His wife, Carmen, was back home in Croton-on-Hudson, New York, caring for their four children and supporting (often supported by) the family’s live-in housekeeper. Meanwhile, in Philadelphia, Smith’s mistress, Margery Lewis, had recently given unwelcome and illicit birth to the couple’s son. It was the proverbial dark time made darker by the death of Smith’s mother, Nettie, in February. A whirlwind of grief, vengeance, despair, and a kind of ravening idealism drove him into the City of Steel. W. Eugene Smith, Monongahela River from Mount Washington, 1955–1957. Carnegie Museum of Art, Gift of the Carnegie Library of Pittsburgh, Lorant Collection. That’s the myth anyway. The truth is that money more likely brought him there. In February 1955, Smith received a note from Stefan Lorant—the former editor of Germany’s Münchner Illustrierte Zeitung and Britain’s Picture Post—inviting him to contribute a chapter to a forthcoming book celebrating Pittsburgh’s bicentennial. The project was under the imprimatur of the Allegheny Conference on Community Development, a civic booster organization founded by Richard King Mellon, heir to America’s greatest banking fortune. Smith and Lorant arranged a breakfast meeting in Manhattan on March 10, during which Lorant laid out the basics of what was supposed to be a brief but lucrative assignment: two to three weeks shooting slice-of-life scenes of modern Pittsburgh, following a loose script Lorant had devised, with a $500 advance on a total payment of $1,200 (approximately $10,500 in 2014 dollars). Smith asked Magnum, the prestigious photo agency he had just joined, to hash out a contract. By the end of the month, he was living full time in Pittsburgh. “Gene was not the first photographer I talked to,” Lorant later told Jim Hughes, Smith’s biographer. “The first was Elliott Erwitt; Gene was the second.”1 As fate would have it, hiring Smith was a decision both irrefutable and tragic. Pittsburgh in 1955 was the archetypal Rust Belt city, which is to say, the archetypal American city. The 1950 census recorded more than 676,000 residents; it was the twelfth largest city in the country, behind San Francisco and ahead of Milwaukee. Democratic kingmaker David L. Lawrence had been mayor for six years and was coasting to the governor’s mansion. Steel defined the place and its psyche, although sub-industries such as aluminum, glass, petroleum, and shipbuilding had their own strongholds. Pittsburgh’s most lauded names—Carnegie, Mellon, Frick, Westinghouse, and Heinz—were synonymous with America’s economic invincibility. Unlike other industrial hubs, however, Pittsburgh described itself as undergoing a “rebirth,” phasing out its smokestacks for sleek glass towers and its besmirched slums for model urban neighborhoods. It was a city in transition, the brochures said, and Smith was tasked with capturing the bright rush towards modernity. W. Eugene Smith, Dance of the Flaming Coke, 1955–1957. Carnegie Museum of Art, Gift of Vira I. Heinz Fund of the Pittsburgh Foundation. That should have been the first tip-off that what Smith envisioned was more ambitious than a traditional photo essay. Settling into his rented quarters on Grandview Avenue atop Mount Washington, he pored over Pittsburgh history books and maps, blaring Bartok quartets late into the night as he grappled with this smoke-haunted place carved from the commotion of kindred rivers. During the day, he crisscrossed Pittsburgh in his green station wagon and paced neighborhoods on foot; he watched the city the way you watch an acid dream derange your senses. For the first month he barely touched his cameras. “The project goes slowly and is yet not well. Although there are slight indications that Lorant and I are with differences in directions and intent, so far the relationship has been pleasant. It is going to take at least four more weeks to finish here, damn it,” Smith wrote to John Morris, his agent at Magnum, on April 20. The “slight indications” of his creative differences with Lorant would soon become a total impasse. Lorant had handed Smith a loose shooting script with 25 categories including “Steel industry,” “Nationalities and their clubs,” “Libraries,” “Life on the river,” “Life in parks,” and “Department stores.” Although Smith’s final photographs illustrate each of these, they do so in the most allusive and multifarious way possible. Even before he arrived in Pittsburgh, Smith was thinking about his work on an operatic scale: “Let it be clear that from that first breakfast I had an essay—for itself, and as a tool against Life—as my driving ends, regardless of my conscientious respect for my obligations to the needs of Lorant,” he wrote John Morris in 1956. From the beginning, Smith understood his Pittsburgh assignment as a way to redeem himself spiritually and artistically, as well as an opportunity to make a definitive statement about photography’s grandeur. Pittsburgh, the city of. An attempt at photographic insight into the always transitory immediate of a city undergoing existence. Its physical characteristics (and physical portrait) through surface line and detailed feature—through an eloquence of vistas given thought, and by the details of many fragments. The long squat buildings of its industries, the blemish of its slums, and how at times both have given way to the cleanliness of cared for greenery in newly built parks close by newly constructed buildings. From the blighted even to how soft with sensual beauty the city can be—seen from high, looking along the buildings and up the river to the moon which has just become fully stated above the horizon. And a further attempt at photographic penetration deriving from study and awareness and participation, a result that would transmit a sense of the city’s character, even unto the spirit and the spiritual—and I would have the result derive from a sensible perspective. W. Eugene Smith, (Pittsburgh Screw and Bolt–Woman Machine Operator), 1955–1957. Carnegie Museum of Art, Gift of the Carnegie Library of Pittsburgh, Lorant Collection. He continued working at a feverish pace. By the time he left Pittsburgh on August 7 he’d shot more than 11,000 images (two subsequent trips in 1956 and 1957 brought the total to more than 17,000). It was a colossal achievement but not without precedent. In the United States, Vivian Maier, a near contemporary of Smith, amassed more than 100,000 images from the streets of New York and Chicago. And at the same time Smith was beginning his Pittsburgh project, Robert Frank was embarking on the cross-country journey that would become The Americans, his seminal 1958 photobook. In Germany, three decades earlier, August Sander’s “People of the 20th Century” was an encyclopedic index of the Weimar Republic that, in scale at least, offered a touchstone for Smith’s own grandiosity. Various other photographers including Lewis Hine, Eugène Atget, and Edward Weston likewise suggest affinities to Smith’s sociological and architectural excavations. Left: Fran Erzen, Portrait of Eugene Smith, ca. 1955. Carnegie Museum of Art, Gift of the Carnegie Library of Pittsburgh, Lorant Collection. W. Eugene Smith, (Industry), 1955–1957. Carnegie Museum of Art, Gift of the Carnegie Library of Pittsburgh, Lorant Collection. Miracle is an apt word, as the idea of salvation was uppermost in Smith’s mind and photographs. In one image, Saint John’s Greek Catholic Church stands in the foreground while behind it are the jutting smokestacks of the A.M. Byers pipe factory and the gray Monongahela River. A billboard advertising Black Label beer is adjacent to the church. The image distills Smith’s experience of Pittsburgh as a place suspended between faith, industry, and desire, and perhaps unable to reconcile that trinity. Another image, this one of Saint Michael’s Church with the Jones & Laughlin steel mill in the background, reiterates the theme, with the cathedral’s cross finial obscured by a scud of steel smoke. Elsewhere, Smith photographs the interior of the East Liberty Presbyterian Church from a bird’s-eye perspective, just as he does the interior of the Mellon National Bank, presenting both as places where people genuflect to the twin deities of God and money. Money, or the lack of it, comprises another motif. Men loiter outside the International Union of Electrical, Radio, and Machine Workers, whose window bears a notice written in shoeshine: NO WORK UNTIL FURTHER NOTICE. A coal worker stands next to a door papered with signs, one declaring simply WORK, while another declares WORK SAT-AND MONDAY, and yet another ARE YOU WORKING—THEN MAKE THE PLACE SAFE! Four men idle on a nighttime street; placards around their necks identify them as strikers from Local 1272. Then there are portraits of Pittsburgh’s rough neighborhoods, ziggurats of shabby houses and rutted yards broken by railroad tracks that symbolize unattainable wealth. And nearly everything everywhere insinuates the black promise of steel. Some of Smith’s most dramatic images are of Pittsburgh’s reigning industry. One of his most iconic photos—and the one he chose to open every spread of his Pittsburgh portfolio—shows in close-up the head of a steelworker wearing goggles and a hardhat. Each goggle reflects a plume of flame, and the worker’s face is ambiguous. Is he reverent? Contemptuous? Hallucinating? When asked about the image later, Smith said, “I wanted to show that the worker was fairly well submerged beneath the weight of industry; the anonymity of the worker’s goggles and factory behind him told the story. Still, I did not want the worker to be entirely lost as a human being.” Yet, Smith’s factory photos are more allegorical than documentary. Workers are almost always depicted with faces averted or shadowed, apparently transfixed by the inferno broiling around them. These are images of labor as primordial and hellish. It’s impossible to mistake the Biblical undertones: Mankind fell and was doomed to Pittsburgh. It’s a fall that repeats itself in eternal, indiscriminate repetition. Far from being exempt, children seem the harbingers. In one image, two young African-American boys brandish a decapitated white doll, reflecting, if only subliminally, the segregation of the 50s and heralding the race riots of the 60s. In another image, a young boy leaves his paint-covered handprints across a white wall. The prints have an eerie quality, like a blood tattoo announcing plague. In yet another image, a young boy holds a toy knife at his side while someone off camera jabs a wooden stick at his chest. The boy looks with despair towards someone else off camera. In a fourth image, six children cluster around a sign denoting Freeland Street. The child in the middle has a cast on his right leg and slumps on crutches, while the girl and boy to his left look behind them towards the empty residential street. A trio of girls in the left foreground sits on the curb with bored dissociation. It’s a portrait of paralysis, both physical and emotional, rendered grimly ironic by the street name. 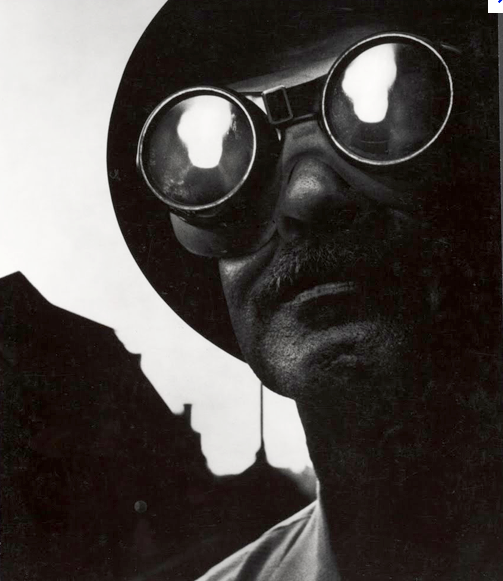 W. Eugene Smith, Steelworker, 1955–1957. Carnegie Museum of Art, Gift of Vira I. Heinz Fund of the Pittsburgh Foundation. Irony—or cynicism, its surrogate—runs through Smith’s Pittsburgh project with the inexorability of train tracks. In a sense, the Pittsburgh that Smith documented was a Pittsburgh he created: a doppelganger city conjured from his own fantasies, prejudices, and obsessions.3 Smith, a frustrated playwright, saw in Pittsburgh the raw potential for a theatrical magnum opus. “A comparison to the playwright probably comes closest to illustrating the way of my thinking in building a work,” he wrote. Indeed, many of his photos, particularly those of city streets at night, have the allure of empty soundstages. Smith described the people in his images as bit players enacting dramas of which he was just the observer, although clearly he saw himself as the beneficent director as well. Images taken backstage at Playhouse Theater draw a literal analogy between Smith-as-photographer and Smith-as-director. If failure is the essence of Smith’s project, that’s because what he set out to capture never truly existed. His attempt to delineate Pittsburgh as a place separable and distinct from its human swarm was sabotaged from the start. What is a city except a consensus of human longing? “I remain—ashes within ashes,” Smith wrote to his uncle in 1958, perhaps unconsciously adopting the incendiary imagery of the city he’d failed. For Smith, Pittsburgh was one long desolate mirage, infinitely apprehensible but utterly elusive. Forever after, anyone viewing Pittsburgh through his eyes would see a city of paradoxes, ambivalent about its past and uncertain about its future, waiting to be reclaimed by nature. It’s a city doomed to its own eternal cycles of heaven and hell. The mystery of Pittsburgh, finally, is not what we don’t see but what we do. This article originally appeared in Belt Magazine. Take a closer look at the photographs W. Eugene Smith shot during his time in Pittsburgh. View images from the collection.